In July 2015 I undertook the responsibility to functionally establish the American Muslim Institution from scratch and a clean slate. Today, AMI is a full fledged, well recognized organization brimming with programs and activities to change perceptions about Muslims. I am pleased to accomplish the mission and turn the business over to the Board Members. The Mission accomplished details will follow my notes. In March 2017, I will disappear in to woods and finish working on my two books; “Standing up for others” and “Mistakes American Muslims have made.” God willing the books will be promoted by my friend Sean Hannity at Fox News. In April, I will undertake the work of establishing the organizational structure for the Center for Pluralism and invite qualified members to join the board as well as trustees. This would be our legacy to leave behind. Our advisory board members will include a representative each from Atheist, Bahai, Buddhist, Christian, Hindu, Humanist, Jain, Jewish, Muslim, Native American, New age, Pagan, Shinto, Sikh, Unitarians, Wicca, Zoroastrian and others such as LGBT community. It is about inclusion, no one who is willing to be a part of the whole should be left behind. Pluralism is my life time commitment and passion, and it runs through my veins. This is all I want to do in my life of whatever is left. I could have made a lot of money going back into home building or business consulting like every one else, but I chose to do where my passion led me to, where there a lot of fulfillment in life. What is life for if don’t live the life you want to live? Islam will remain an equal part of the family of faiths in Pluralism. Islam is about pluralism and vice versa, more and more Muslims are re-embracing Pluralism, this was the way of Prophet Muhammad (pbuh). God willing, I will be following his model of conflict mitigation and goodwill nurturence. We invite people of all faiths to head the department of their respective religions, there will be rigorous tests to make sure one has the aptitude, inclination and willingness to respect the otherness of others. It means you simply cannot denigrate faiths of other people, they are as dear to them as your faith is to you. We have to bring the change, what is point in running the run of the mill operation? If you seriously believe in Pluralism, kindly visit www.Centerforpluralism.com to learn about us. This Organization is well built up in the last 20 years with incredible amount of activities, accomplishments, write ups and TV Presence. Now we are ready to take off and bring positive results to America. Farooq Wazir Ali has supported “Understanding Religion, all the beautiful religions” twice before and hope he will continue to do that. 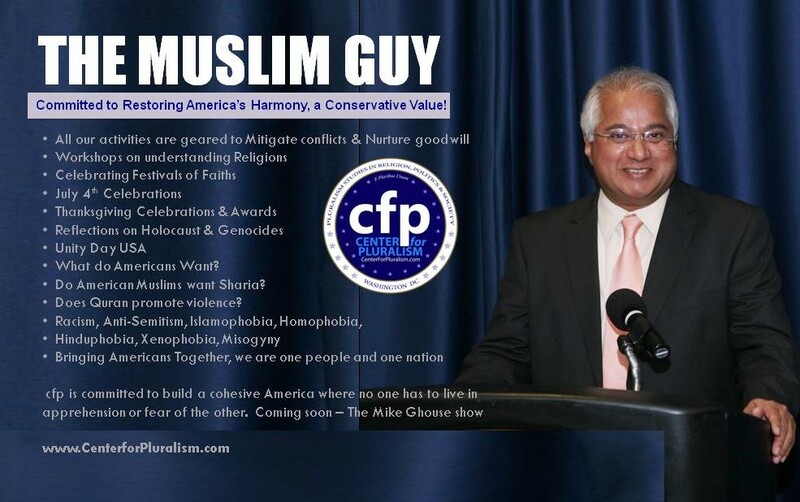 Dr. Basheer Ahmed and Dr. Nauman Anwar have supported events dealing with Quran Burning Pastor Jones, and Quran bashing pastor Robert Jeffress, Unity Day and other events, there are a few others who have supported individual events. Supporting our pluralism workshops, radio talk shows, and events are: Dr. Harbans Lal (Sikhism), Rev. Bill Matthews (Methodist), Pastor Frederick (Baptist), Rabbi Haas (Judaism), Dr. Pradeep Shah and Kirit Daftary (Jainism), Kambiz and Regina Rafraf (Bahai), Dana House-Elf (Wicca), Amy Moonlady (Dao), Mary Ann Thompson-Frenk and Peggy Larney (Native American) and many more in A-Z religious traditions including Atheism. We are looking to begin Pluralism Radio Talk show in Washington DC by July this year, if I have the funds, it will start tomorrow. I will continue to work on mitigating Islamophobia and facilitating mainstreaming of Muslims. We will intensify our relationships with the media and policy makers in having them see the overwhelming majority of us who stand shoulder to shoulder with fellow Americans in keeping America safe, secure and prosperous. We hope to persuade them (Media and Policy Makers) to discount the opinions of 1/10th of 1% among us who do not represent Muslims or the American values. All our activities, talks, write-ups, discussions and acts were geared to accomplish our goals expressed in our vision and mission statements. It is like running with the ball despite the hurdles and getting an additional yard even when we stumble. We all have to uplift and listen to each other if we want to succeed as a group. Bing.com shows 13,500 entries for “AmericanMuslimInstituion” – in quotes is the right search mechanism, but an average person will give space in between the three words and it jumps to over 8 Million entries. Google shows 16 Million entries for American Muslim Institution but if you narrow down to specifics “American Muslim Institution” it gives 3,690 – The growth will be organic.. It’s an average 237 entries a month. Yahoo did not give the statistics. We have made sure that we have a strong presence on the net and we will continue to multiply our presence. It takes a lot of effort and time to accomplish this with a single staff. 28 press releases were sent out, averaging 2/month. Each one of the press releases has made it to over 80 news papers around the nation giving us a tremendous presence on the national scene and flooding search engines. We used a service that rarely any other Muslim organization has used. We remain pro-active in whatever we do. 126 Items were posted on our website, averaging 8 pieces/month – some of the articles have multiplied many times by posting on other sites. Again, those items have multiplied by 30 times empowering AMI on the internet. Someone or the other is quoting us somewhere or replicating our pieces on the net. 174 entries are shown – where as we actually have about 30 videos, the numbers will continue to increase if others copy and post a part or full video. We have our own channel. We have averaged 1 TV presence/a month and 2 Radio presences and over a dozen print media and the internet media. We are everywhere, and on an average we are attending about a dozen events a month, including Brookings, Cato, Heritage, National Press Club, International religious freedom, Freedom Institute, and other think tanks in addition to the Interfaith and Muslim events. In every place, we are making our presence felt by sharing a one minute announcement or a short talk about what we do. 8 events : The “State of Muslims in America” is a monthly conversational program where we bring experts from the public, faith communities and the Departments of State, Homeland Security, Justice and Defense to discuss the state of affairs of Muslims and the other vulnerable communities and offer pluralistic solutions. We are guided by the First Amendment and stick within the parameters of our constitution. This program contributes the most towards our long term objective. If Muslims don’t tell what Islam is, then others will continue to present the distorted version of Islam to their audience and the media.” This course is for every American who wants to learn and share correct information about Islam – so we all can drop misgivings and start living as neighbors and friends, understand each other and build safe communities. We particularly urge the youth to participate, as it is they who have to live in the world, and they had better shape the world they want it to be to live in peace and prosperity with fellow Americans. We hope to produce 100 such speakers by the end of 2017 with 25 ready to go by January 2017. We have built strong coalitions with Christian and Jewish organizations and working on Baha’i, Buddhist, Hindu, Jain, Native Americans, Sikh and other traditions. We can develop relationships with Atheist, Pagan, Wicca, LGBT and other communities. We have built up good relationships with the Christian and Jewish communities to hold joint events. We have been attending Intrafaith events, and have attended Shia and Ahmadiyya events and looking forward to be a part of Bohra, Ismaili and other denominations. We have good working relationships with several mosques and they are all willing to do joint programs. I cannot do more than what is done. If we put some math into the time it takes to achieve what we have achieved with one man staff we will see that it takes at least three staff members. When we can afford a full time assistant, we can focus on other critical things – we have uplifted AMI and established, now, it is time to grow. Ideally my time should be spent on research, speaking, relationships, initiatives, development and fund raising. This is my passion and I am willing put in whatever time it takes to get the job done and this will remain my contribution in establishing AMI with all the humility.